Lots of apps available... "same API using for notifications on Android Wear"
"Wouldn't it be great if building an app for your car was as simple as building for your phone?" Guess what? 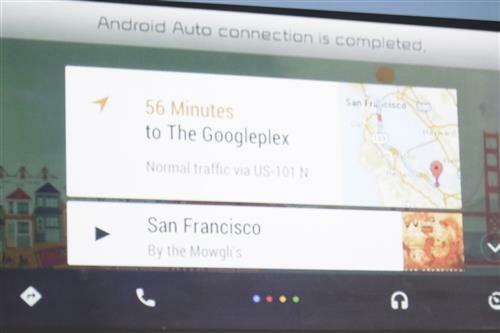 Google announces the Android Auto SDK. 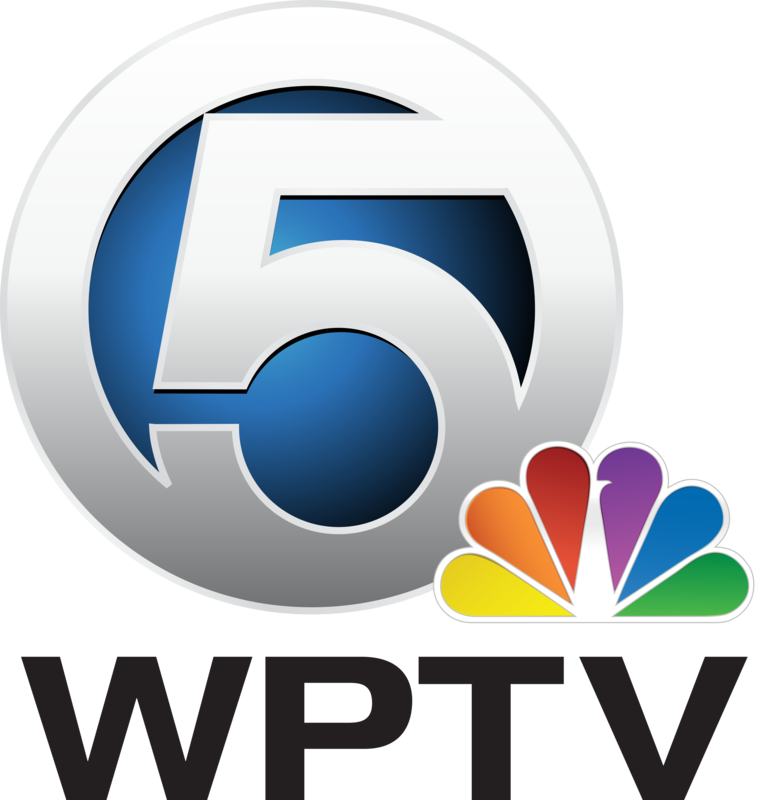 Partners include: Pandora, TuneIn, Stitcher, Spotify, Songza, iHeartRadio, and more. First up will just be audio and messaging apps, meaning you won't get full control of the display by the sound of things. Likely in the interest of distraction. 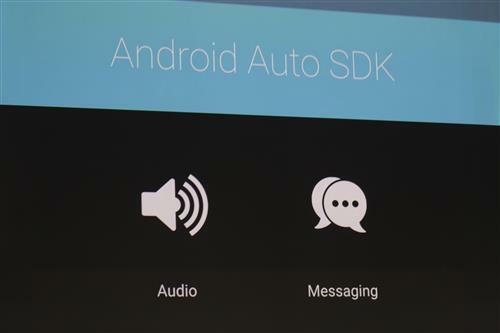 New AndroidAuto SDK will help you "focus on just making great apps for the car," he says. There is an SDK, so this is indeed much more open than Apple's CarPlay, which as of now is still locked down. 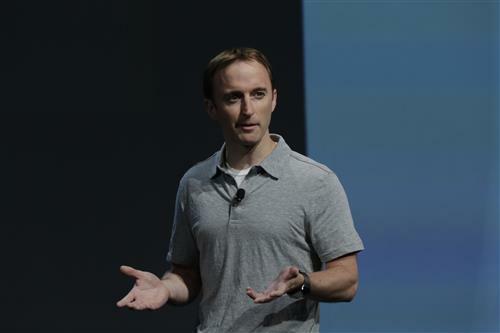 "Wouldn't it be great if building an app for the car was just like building an app for a smartphone or a tablet?" Now we're getting to how this is going to work. 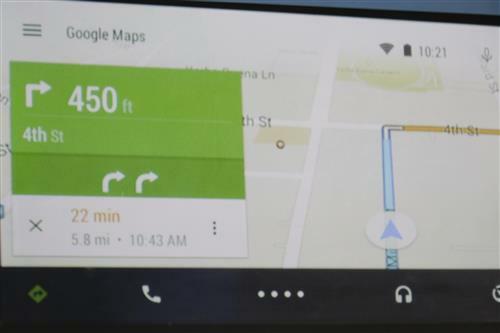 Google maps with turn-by-turn directions available on Android Auto. He just dictated a voice command, and said "sure" to send it. It went away. 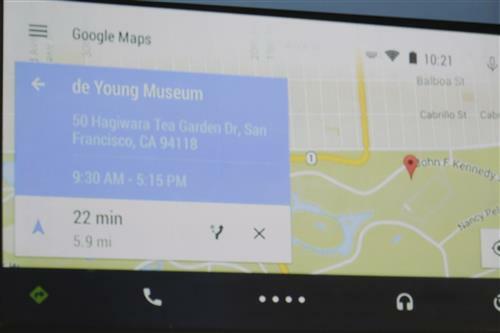 Google Maps on Android Auto is voice enabled. Product manager Andy Brenner asks the car infotainment system how late the DeYoung Museum is open. He gets an answer, decides to visit, and asks for turn-by-turn directions without having to tap or swipe. 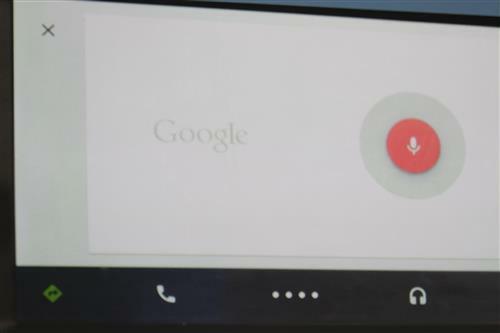 There's a button on the wheel to trigger voice commands. 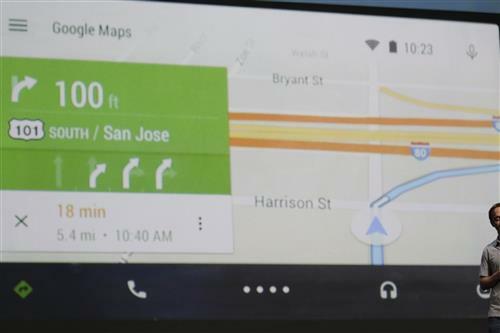 All of these AndroidAuto apps look and feel like Android on a wide screen. 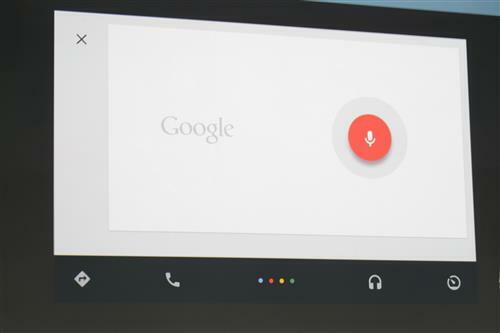 It's more or less your Android phone in landscape mode. 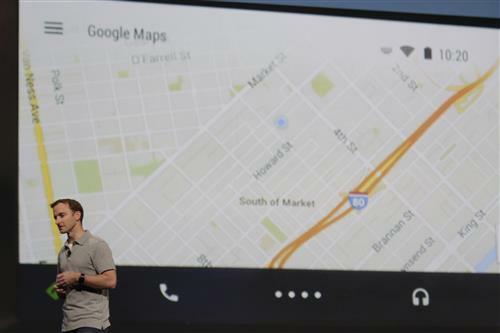 The maps demo worked smoothly. "How late is the De Young museum open today?" The answer came back, and then navigation began. He just asked a question via voice, and got an answer spoken back to him. The row of buttons on the bottom is Maps, calls, music, and what looks like a gauge, plus a row of dots that will probably be for triggering other apps. 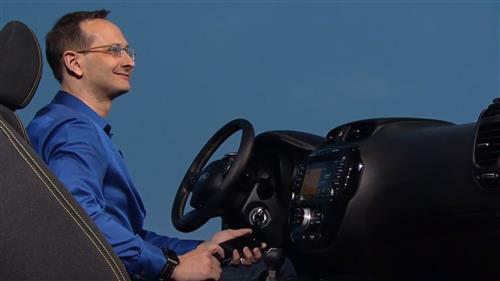 You can use buttons on the wheel, or voice, too. 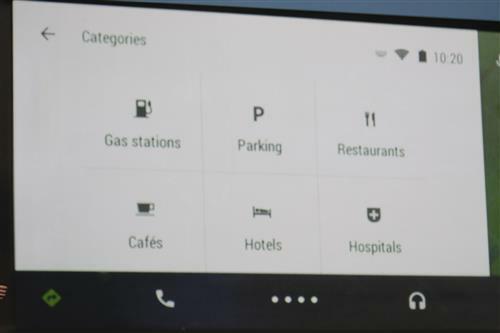 "Simple, glanceable controls for the car" is what this is being described, and indeed it is easier than the base Android experience. Problem is, how many existing cars on the road will be able to work with this? 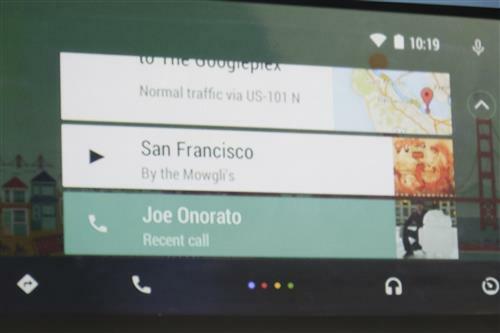 Andy Brenner, product manager at Google, is demoing Android Auto. 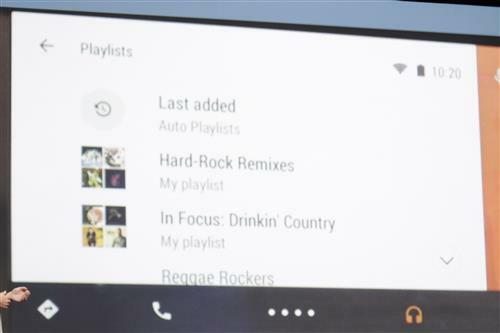 Apps are running on Android phone, so experience changes with updates or device upgrades. 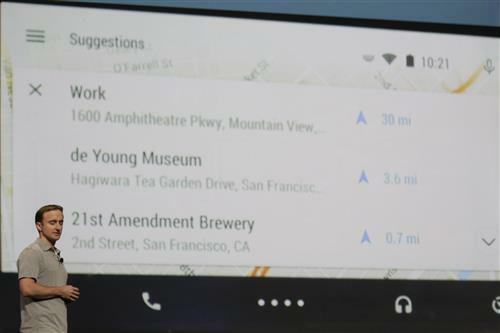 Screen shows destinations, reminders, contacts, music. 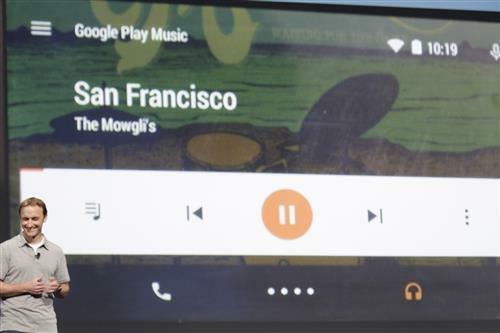 Really low-quality video showing off the Android Auto demo. Jittery and blurry. 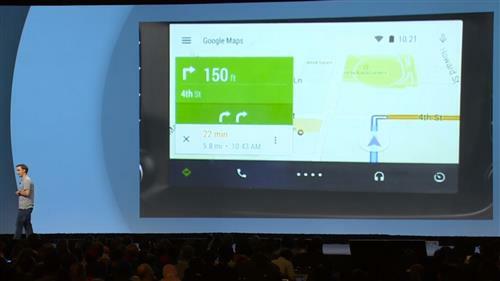 We can put Google Glass on the Moscone roof, but we can't drive a car onto the stage. 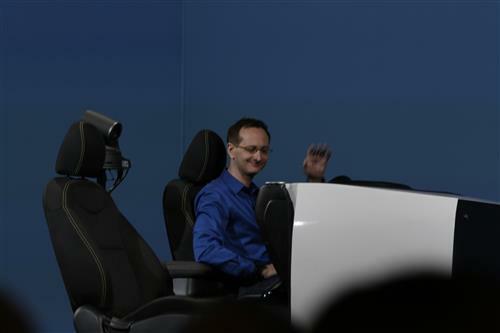 Indeed, no actual car on stage, but the blank, just the interior, for a demo.